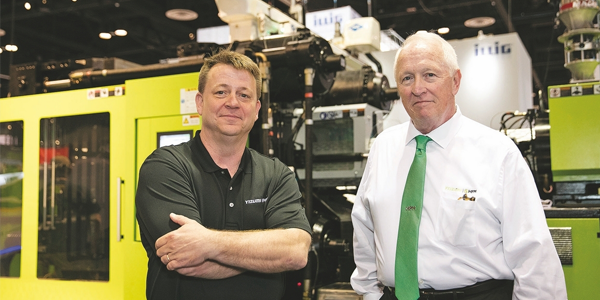 The US-unit of the Yizumi Group has announced the sale of a 3500-ton, dual-platen UN3500DP-N-75500 injection moulding machine following its exhibit at NPE in May. The company says the sale to Otto Recycling Systems, which was finalised after meetings at the show, sees the large-tonnage machine used to manufacture waste containers. “We’re very pleased to be providing a high-productivity moulding system to one of the leading manufacturers of waste containers in the U.S.,” said Bill Duff, General Manager, Sales and Marketing for Yizumi-HPM. The injection moulding machine sold to Otto Recycling includes a full automation package, including a 5-axis servo robot, safety enclosures, and conveyors. “We’re excited to partner with Yizumi-HPM for this high-value package which not only meets our financial and warranty requirements but delivers optimum performance and cycle time improvements,” said Michael Henry, Director of Procurement for Otto Environmental.